Having been a part of several film productions, big and small, I was excited the see the quality of this production within the first few frames. Smooth camera pan, clean film quality, fantastic post-processing, and kudos to the cast for excellent acting! There’s an energy about this film that reminds me of the 80s teenage movies, rather than the latter Disney-inspired sugar rush. It lends itself towards focusing on the characters without feeling like something is missing or constantly hoping something witty would keep your interests high. So I guess it does hold the 90s vibe it was designed towards. But this isn’t a mere teenage short film, it’s something more! 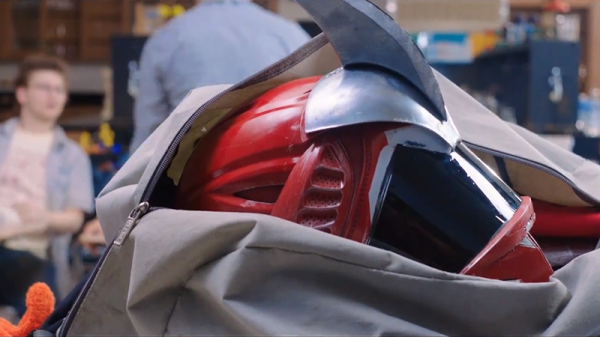 Amidst the weekend detention scene, with barely a minute into the film, we see a helmeted hero take on a clawed monster just outside the classroom. And that’s the kicker! Paying homage to the kaiju films of Japan and the tokusatsu (special effects) genre which includes Ultraman, Masked Rider, Godzilla, and Gorenger/Power Rangers, Secondary Education has been great fun to watch. While you do get a lesson in science during the story, the events and the madness within the 10 minutes are presented to the audience with great pacing. Even the kaiju itself falls in line without being a distracting exaggeration to scene sequences. I’d also like to commend the special effects of this film, it has that classic visual style of old film effects… the ones where they had to apply it directly into the film strips. There is honestly a lot I could compliment about this assembly, but overall, I highly suggest you guys checking out this 90s educational entertainment film. Justin Lin, the director of some of the coolest Fast & Furious movies in the franchise, has this hosted on his premium YouTube channel, YOMYOMF. So if you can understand how amazing Justin Lin is with the material he’s created, you can anticipate the level of polish. My only gripe is that sometimes the music track can be sharp enough to be distracting from the sound mix. You can check out their production thoughts at director Jon Truei’s blog.